The Numpties breathed a sigh of relief when the preamble made sense at once: we drew a coloured line down the side of the clues to receive the letters we were to remove from clues and whatever the nine consecutive strings of letters were going to spell, and I scanned the clues, as usual, to confirm that Hedge-sparrow had renewed his membership of the elite Listener imbibers club. I didn’t need to read far as ‘a spot of mother’s ruin’ appeared in the second clue. ‘One local Democrat against spot of mother’s ruin (4)’ (UN + D + O(ther) with and extra M extracted from the clue). Not content with the gin, we found him attempting to ‘Stupefy stokers with 216 gallons of ale, past its use-by date (4)’ (Crikey, Hedge-sparrow!) That gave us the rare use of S = Stokes and TUN = 216 gallons, with an extra R extracted from the clue. A CETE of badgers, a MURDER of crows, an EXALTATION of larks, a PARLIAMENT of owls, a BALE of turtles (of course we had to look that one up! ), an UNKINDNESS of ravens, a WISP of snipes, a CHARM of goldfinches and what was left? A MURMURATION! We had to check that that was what an OMNIUM GATHERUM of STARLINGS is called. We had a couple of ends to neaten. MANGOSTEEN had been the only word that would fit with the clue ‘Fruit feast in bags brought back following piece work (10)’ and now, we were able to reason that the extra letter in the clue had to be F so we were putting E(ast) into ‘bags’ NETS, and reversing it after ‘piece’, MAN and ‘work’, GO. That was a complex piece of cluing! We now knew that the G of GATHERUM was being extracted from the clue to LEHR, ‘To start with leaves gum to get hot inside oven (4)’ and, working backwards from the solution to the clue (as we so often do!) realized that our last outstanding wordplay gave us L(eaves) + ER (for um) getting H(ot) inside. 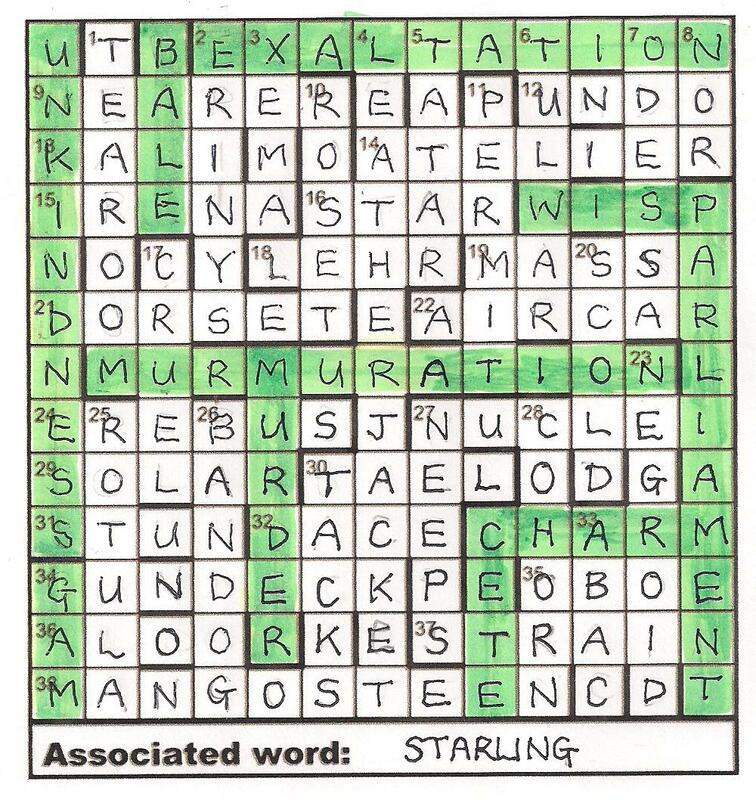 This crossword was a pleasure to solve from start to finish and I was delighted with the versatility of Hedge-sparrow’s cluing. Nothing seemed too difficult; there was a lovely range of types of clue and an equally wide field of topics touched on in the surface readings. Many thanks, Hedge-sparrow. This entry was posted on 6 February 2015 at 4:00 pm	and is filed under Solving Blogs. Tagged: Collective nouns, Hedge-sparrow, Omnium gatherum. You can follow any responses to this entry through the RSS 2.0 feed. You can leave a response, or trackback from your own site.